We all know the stereotype of the busy businessman asking his secretary to order flowers for his wife on her birthday. He dashes out the request and then (presumably, because the movies / Mad Men never seem to show this part) the secretary rushes to the florist or places a phone call to make sure the Boss Man doesn’t get in trouble on this special day. Considering that as many women as men are in the workforce these days and that people buy flowers for all kinds of reasons, I’d say that image is pretty antiquated at this point. Equally as antiquated? The process by which we buy flowers, at least if BloomNation has anything to say about it. BloomNation is a Los Angeles-based company that lets you order artisanal flower arrangements from local florists, all online. As any regular reader knows, I’m a huge fan of any company that lets me reduce my face-to-face or phone time, so BloomNation got an automatic thumbs-up even before I delved a little deeper to see just how awesome they are. A florist only has a limited amount of options on display at any given time, but if your order your flowers from BloomNation, you get a vast choice of gorgeous arrangements, for any occasion. Each florist obviously wants you to choose their work over all the others, so these pieces are clearly the best of the best of what they’ve got. Confession: Scrolling through these arrangements is making me start to doubt my usual handfuls of wildflowers picked hastily on the way home to my mother’s house. Obviously I knew previously that flower arranging is an art, but this site takes it to a whole new level. 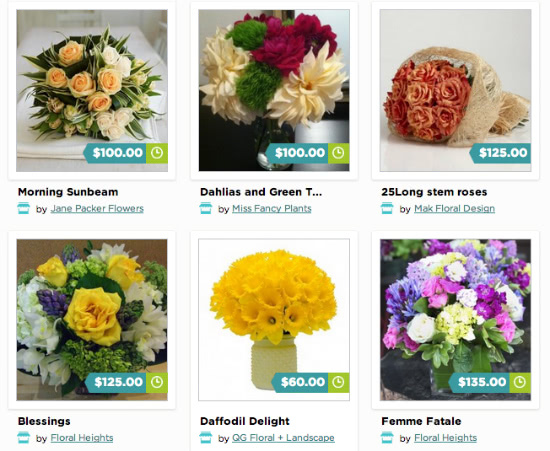 Pick your city, browse the options, pick out your flowers, give them delivery info and pay with your credit card. Bam. Mom has a beautiful bouquet delivered right on her birthday and you’ve wracked up favorite-child points to last you through the next couple of months, at least. Taking the simplicity up one level, BloomNation also gives you a list of categories you can choose from. Not sure about the difference between Congrats Flowers and New Baby Flowers? Me neither, but the experts on BloomNation will make sure you never commit that embarrassing error again. If you know exactly what you want, you can narrow it down and if you have no idea, you can keep your options open because their search page also lets you focus your criteria based on price, bouquet type, occasion, color, or flower style. There’s a bouquet for everyone! BloomNation’s services are currently available in 2,920 US cities and counting, meaning it’s pretty likely that there’s a florist near you. Unfortunately, I’m from a small city in northern Vermont, so my mom is gonna miss out this year. Any florists from Burlington reading this? Want to help me out? Click here to sign your shop up for this great service. My mom really deserves it.